Why Are Migrants Surging Into Europe Now? : Parallels The steady stream of migrants in past years has turned into a torrent this year. Here's a primer on the main forces at work. 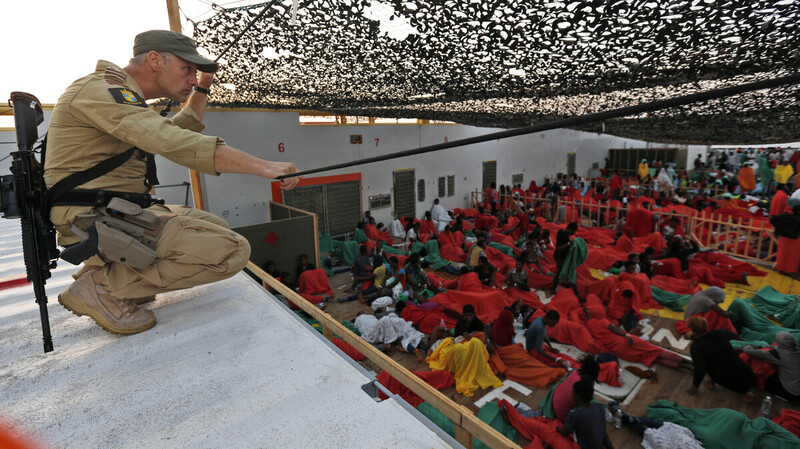 A Norwegian police officer on the bridge of the Siem Pilot ship watches over migrants rescued in the Mediterranean Sea on their way to the Italian port of Cagliari on Sept. 2. 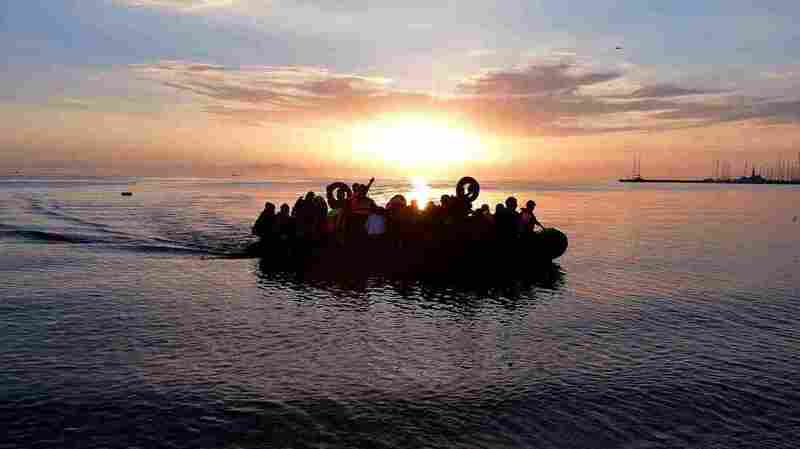 Hundreds of migrants were rescued a day earlier. The United Nations says more than 300,000 migrants have set out from North Africa and the Middle East on the Mediterranean Sea for Europe this year so far — 40 percent more than in all of last year. On any given day now, hundreds of people, perhaps thousands, are drifting in ships or clinging to boats that are little more than inflatable rafts. They go in other ways, too. Jumping fences in Morocco to get to Spanish territory. Cramming into trucks from Turkey. Riding trains across Europe. In a recent 24-hour period, the Greek coast guard rescued a thousand people in the Aegean Sea. They are children and old people. Middle-aged parents with their last possessions and their kids on their backs. They're professionals who have left their jobs and homes behind, and laborers whose neighborhoods and industries have collapsed in wars. Most are technically refugees — defined as people fleeing war or persecution. Here's a primer on the recent surge. The U.N. counts 15 new conflicts in the past five years, and the big one is Syria. More than 11 million Syrians have fled or been driven from their homes in that country's civil war since it started in 2011. Then there's the Islamic State surge in Iraq, where 3 million people have been displaced since January 2014. Somalia, Sudan, South Sudan, Libya, Nigeria and other countries are wracked by war or insurgency. Many people are also fleeing Eritrea, a country that's not at war but that is run by a repressive regime. Some settle in new countries or find new places even in their own countries. But many can't do either. Turkey and Lebanon, for example, have taken in around 3 million Syrian refugees between them. But both have restrictive laws keeping the refugees from earning a living. So, many are on the move. Europe is the closest wealthy, safe and accessible region from the Mideast and Africa. In some places, it's very close. Some Greek islands with tourist beaches that have become landing zones for migrant boats are just a few miles from the Turkish coast. More than 230,000 people have arrived in Greece and about 100,000 in Italy so far this year. Also, some European countries are known for welcoming asylum seekers and providing benefits to help them get started in their new homes. But those countries are mostly in northern or western Europe. Migrants might arrive in Europe first in Greece, but after living on the streets or in temporary shelter there, they head to more prosperous countries, particularly Germany. Syrian migrants in an overcrowded dinghy from Turkey arrive on the Greek island of Kos on Aug. 29. The U.N. says 2,500 people have died on the seas so far this year. Many routes are perilous even before the sea crossing. They can include walks over long stretches of desert, or abuse from authorities and criminals along the way. The routes to Europe are set out largely by smugglers who summon the migrants to travel with last-minute phone calls. They usually collect the money up front and show little concern for what happens next. Smugglers have left ships with hundreds of migrants on board to drift without a crew. They've locked migrants in the hulls of sinking ships, and recently, 70 migrants suffocated in a truck on an Austrian roadside. European governments blame smugglers for the dangers, but migrant advocates say that as long as there are few legal routes toward safety, refugees will continue to risk dangerous illegal routes. There's a patchwork of laws governing immigration and rescue procedures that make things more risky. For a while, migrants were told that they had a better chance at asylum if they were rescued at sea — so they purposely sank their vessels, gambling with their lives that European coast guard ships would find them. European countries disagree about how to handle the crisis. Southern countries like Greece and Italy want other countries to take them in. European Union rules say migrants should be settled where they first land, but now enforcement of those rules is becoming impossible. Some European countries have been opening their doors. Sweden has a history of welcoming migrants. German officials say they will receive 800,000 or more of the current wave, far more than any other European country. Countries farther away have taken in very few migrants. The U.S. has taken in 1,500 Syrians since the start of the civil war and promises to accept up to 8,000 more next year. If the goal is to stop the migration, that would require ending the conflicts in Syria, Iraq and elsewhere. Almost all refugees say they would go home if they could. Larry Kaplow is NPR's Middle East editor. Follow him at @larrykaplow.